Former Morry's space was once auto dealer and then refrigerator showroom. Vintage. Photo by Michael Horne. The Ford plant triggered a surge of retail construction on Prospect Avenue, as old houses gave way to new developments. In 1916 Oscar Brachmann decided to build a one-story retail building at what was then 415-417-Prospect Ave., across Kenilworth Place from the giant, five-story, 300-foot-by-120- foot Ford factory. Brachmann was issued Permit #6579 to construct a 55-foot-by-112-foot “Store Building” for $15,000, hiring architect Martin Tulgren to design it, and the Riesen Brothers masonry firm to build it. The site was excavated beginning May 22nd, 1916. and by September 21st, the building was “about completed,” according to the inspector. The handsome yet utilitarian building had copper storefronts in the 12-foot six-inch high rooms, with ample plate glass windows to show off the wares. The building had coal heat, fired by a state-of-the-art Modern Stoker furnace. Once finished, Brachmann leased the corner space to the Ford Motor Company as a place to sell the cars made across the street. Apparently Brachmann was pleased with the location, so on March 15th, 1919 he had the Metropolitan Construction Co. take out a permit to spent $34,000 to “Erect 2 additional stories to present one story store building and arrange building to be occupied by stores and 20 apartments.” The modest apartments did well, while the Ford dealership moved up the street two blocks, where it remained until the construction of the Whole Foods Market. Brachman’s retail space was later filled with a variety of useful merchants, selling heavy duty stuff like refrigerating and heating equipment. 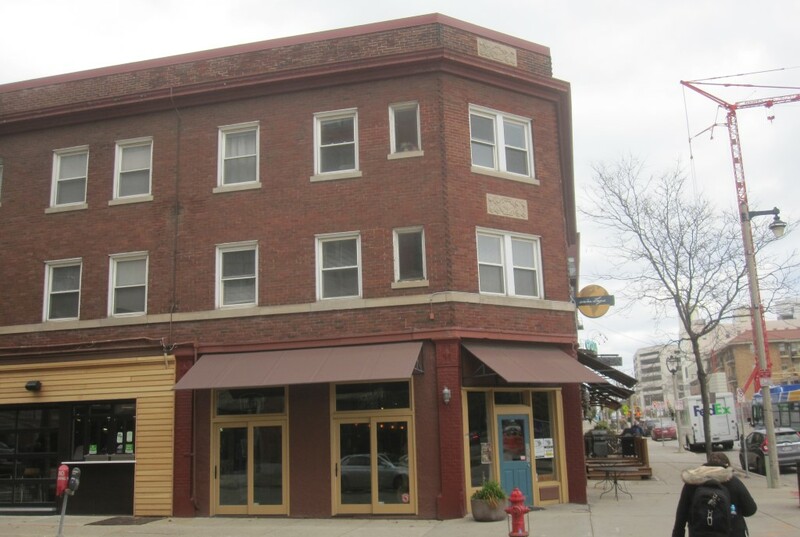 Copeland Refrigeration Co. occupied the corner space on Prospect and Kenilworth by 1921, with the Shellenberger-Gregg heating contractors located in the space to the north. By 1929, Shellenberger-Gregg was still occupying the north part, but was selling oil burners, including, presumably, to the owner of the no-longer-coal-fired building in which the company was located. The two toilet rooms were a key to the transformation of the structure to a use that remains today. Prohibition was over, happy days were here again, as the song of the day went, and the busy Ford workers were able to head right out the factory door and into a tavern. Kowalewski called the place “The Prospect Inn,” and settled in for a long run in the location, operating there for some 30 years, just until the dawning of the Age of Aquarius. Over the years he had a lot of neighbors to the north. On December 5th, 1944 Victor Becker got a permit to sell antiques for 30 days in the former heating company space. That same month, A.A. Olsen got a permit to sell Christmas trees there. By January 2nd, 1945, the space to the north of the corner bar became the International Art Gallery, operated by Frederick W. Heinz of 2037 N. Lake Dr., a nearby address that is not as fancy as it sounds. (It is an apartment building.) In 1947 E. B. Houtz of 1028 E. Juneau Ave. (the Knickerbocker Hotel) ran his art gallery here. By 1949 the art gallery was gone, replaced by a coin-operated laundry. It’s always good to have a tavern near your laundry, so Ed probably kept a lot of change on hand. He also had 10 cent drink tokens redeemable on future visits if you had to leave in a hurry to tend to your laundry. In 1952, “Eddie’s Prospect Inn” as it was now called, had a Schlitz sign in the window, and in 1954 a Pabst sign appeared. Finally, the laundromat played out by 1964, and the space occupying those north three bays of the building was occupied by Carmello J. Lavora, who resided at 1644 N. Van Buren St. 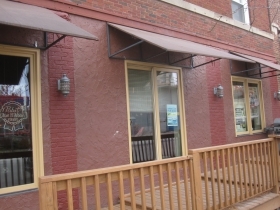 He took out a lease, and provided the spot at 2203 N. Prospect Ave. with a “new front bar and new toilets.” He hung a vertical sign above his mid-building entrance, and dressed up the facade after a fashion with little lamps and little windows and an awning. He called the place “LaVeer’s,” and it opened in September, 1964. Morry’s was an instant hit. In April, 1976, it celebrated its 10th anniversary, and Damien Jaques of the Milwaukee Journal reported on the success of the bar. But it was a classic singles bar, and Morry’s packed them in. Katz gave a start to a number of Milwaukeeans who themselves became tavern legends, including Steve Sazama (Saz’s), Tom Shepard (Brown Bottle, Brew City Bar-B-Q), Jon “Bingo” Berta and Mark Sherman, all quite active in the later years of the 20th century. By 1972, the copper-framed plate glass windows were long gone, replaced with plywood and a hideous checkerboard paint design. By 1977 the tavern footprint had changed. The oval bar that had been in the front of the room moved to where it is today, and the women’s and men’s rooms likewise moved. 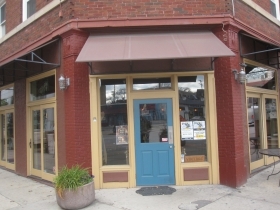 The corner bar expanded to the space to the west, and added new restaurant equipment, another bar and other amenities, including an office for Morry in the southwest corner of the building. Meanwhile, the place to the north, once LaVeer’s opened as Farfel’s in 1983. In 1986, after 20 years of being a tenant, Morry Katz bought the building, and merged his Celebrity Club with the Morry’s space. 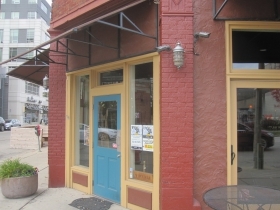 By 1989, Morry’s controlled the entire 6,358-square-foot tavern — a huge space. Morry’s last day of business was December 31st, 1995. A week later, plans were announced to open Vox, operated by Jon N. Vincent. The bar was yet again reconfigured with the west portion being known as Yield, now Yokohama. Katz sold the building for $1,000,000 in 2000. The current owner purchased it last year for $2,500,000. 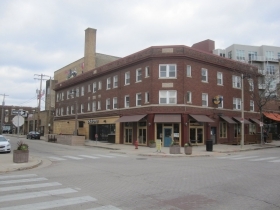 Today the tavern is recognizable as a Milwaukee kind of place. The interior has exposed brick, and panelled areas that should be windows, and once were. There are a couple of old and vintage Milwaukee beer signs, and a number of reproductions. A corner holds a plastic tree, and a Nesco on its stand, just waiting to be filled with bratwursts. There is a miniature Pabst Blue Ribbon dog house, and an old scale. The floor is the original terrazzo. A chalkboard lists specials, which include cocktails with descriptions, which weren’t necessary in Morry’s day, when a cocktail’s name was often the same as its ingredients. We now have the “Ruby Mule,” which has “Grapefruit Vodka, Ginger Beer and lime.” The Ruby Mule also comes with an explanation, which cocktails didn’t used to have back in Morry’s day. “Festus rode a mule in ‘Gunsmoke,” remember?” [No.] “His name was Ruth.” Somehow this translates to Ruby Mule. Stick with a beer. 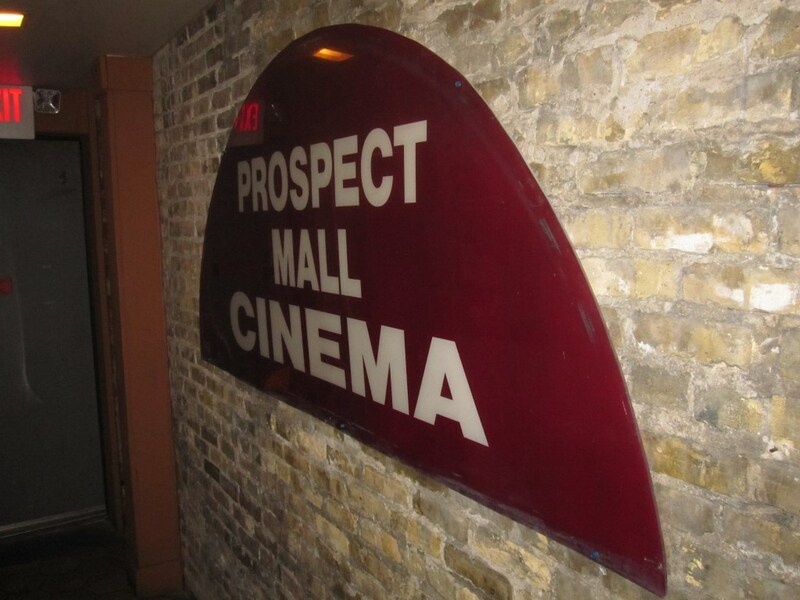 Prospect Mall Cinema. Photo by Michael Horne. 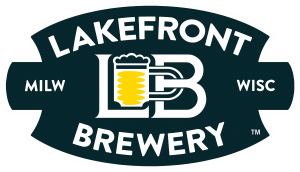 A sign on the wall reminds us that Lakefront Brewery is 30 years old, and Morry’s was an early customer. A stained-glass Pabst sign is above the mirror behind the bar, and a giant Pabst sign is on the north wall. (One of the two owners of the bar is a great-great-great grandson of Frederick Pabst.) There is also an awning from the old Prospect Mall Cinema, and other modestly engaging diversions, including a prominent pool table in good shape. Outside, along the street, is a wooden deck with a grill, another nice Milwaukee touch. We shall see if the addition of hundreds of new apartments will alter the demographics of this bar, or if the infusion of new capital into the building might refine some of the attempts at returning this building to its original design over the years. It would be nice to see the original fenestration be returned, as it was in the Kenilworth Square building across the street, the old Henry Ford plant that gave this neighborhood a jump start a century ago. Vintage will have a direct line for such improvements to the East Side Business Improvement District. Kristin Godfrey, whose family is involved in management of the bar, now serves as the executive director of the BID. 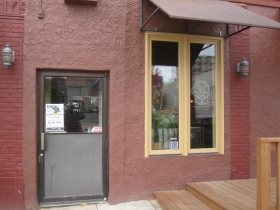 Description: The south half of this bar was the original portion, dating to 1934. The north half held a separate bar from about 1864-1984, when it and the area to the west became one huge bar. This has since been subdivided, and the west portion now houses Yokohama restaurant in the place of the former Yield. Was most famous as “Morry’s On Prospect,” for a certain generation. Year Building Constructed: 1917 with two story addition 1919. E. Tulgren, architect. 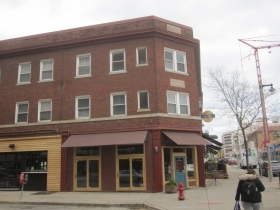 Estimated Annual Rent: Estimated at $22.55 per square foot, annual rent for the 2,138 square foot tavern is $48,212 according to Assessor’s calculations. Bike Racks: Nay. Use the one at Colectivo next door. Love the articles that you do on properties in Milwaukee, the history of the building’s and business’s. I’ve never been to Vintage but want to go there now, after reading your well-researched review, Michael Horne!